Czech susenky (soo-SHEN-kee) are popular cookies served for special occasions and at Christmas, when they become vanocni cukrovi (vah-NAWTCH-nee koo-KRAW-vee). This basic recipe can be transformed into different cookies by varying the shape and sandwiching them together with jam or cookie filling, decorating with different-colored icings, dusting with confectioners' sugar, or leaving plain. The recipes for this traditional sweet are truly endless. In a large bowl or stand mixer, beat together the butter and sugar until light and fluffy. Add eggs and vanilla and mix until completely incorporated. Add the flour and mix into a smooth dough. It shouldn't need to be refrigerated before rolling unless your kitchen is very hot. Roll dough between pieces of parchment paper to 1/8-inch thick or 3/16-inch thickness, if sandwiching cookies together. Remove top piece of parchment paper and cut dough into various shapes. Since the dough doesn't expand much when baking, a mere 1/2-inch space between cookies will be fine. If at any time the dough is getting too soft, refrigerate it for a few minutes and then continue. 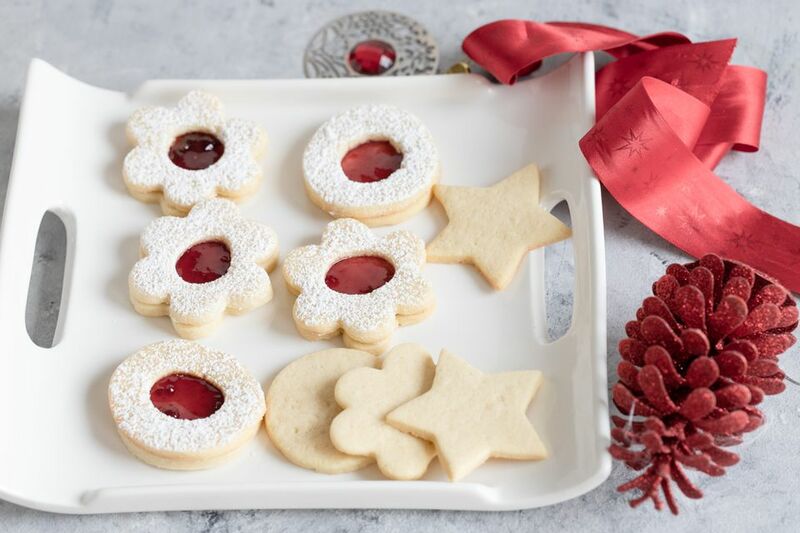 If making sandwiched cookies, cut an even number of plain cookies and an even number of cookies of the same shape that have had a small "window" cut out with a thimble or piping tip so the jam or filling will peek through. Remove the scraps and, grabbing the parchment paper by opposite corners, place it on a sheet pan. Bake 8 to 10 minutes. Do not let the cookies brown, they should remain light but still be baked through. Cool completely. Repeat with remainder of dough. Excess dough can be wrapped and refrigerated. If sandwiching cookies together, sprinkle confectioner's sugar over cookies with a "window." Spread jam or filling on "window-less" cookies. Place confectioners' sugar cookie on top of the jammed cookie. If decorating with icing, it can be left plain white or tinted with powdered or paste food coloring (liquid food coloring will dilute the icing, but if that happens, just add more confectioners' sugar). You can sprinkle with coarse sugar, chocolate sprinkles, or whatever your heart desires.